Once polymer chains can entangle across the interface then you adhesion starts to be really strong. As we will see in the Real app, entanglement takes you easily into the 10's of N/m. In reality this is further amplified by dissipation to give very strong adhesion. As discussed in the Intermingling page, getting polymer chains to intermingle and entangle across the interface is not as difficult (with unlike polymers) as some people say. However, polymer/polymer entanglement requires many nm of intermingling and this is relatively hard to achieve except at high temperatures with heat sealing. Indeed, the heat sealing industry regularly talks about entanglement across the interface to give strong bonds. 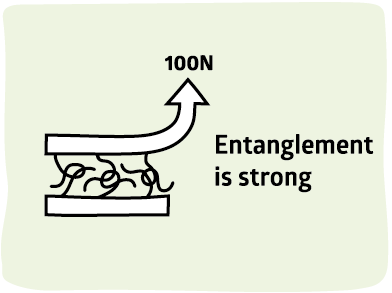 Entanglement is strong because it soaks up energy by large-scale deformation of the whole polymer system. Eventually a polymer chain will break, but that's not what's absorbing most of the energy, it's the large-scale movement that "dilutes" the crack energy over a few nm rather than being an intense force over a few Å. In the Chemical page it is confidently asserted that chemical bonds across the interface are much too weak - comparable to surface energy. 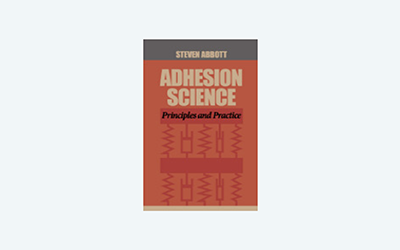 But we know that often chemical bonding is necessary for strong adhesion. The much-used PEI (Polyethyleneimine) primer system simply cannot work without some chemical bonds to the, say, corona-functionalised surface of PE. There is no contradiction in these two statements. What the relatively few chemical bonds to PEI provide (when the PEI also gains a few bonds to the other surface) is the equivalent of an entangled polymer system. When an entangled system is being stretched to breaking point it either breaks at physical entanglements or at chemical entanglements. In both cases the rupture is (typically) a C-C or C-O bond so there is no difference even in principle between a chemically entangled and a polymerically entangled network. The secret of PEI's success is that it is a really useless polymer, even when boosted by being pre-crosslinked (most PEI formulations are "crosslinked"). The aim of a PEI primer is to never be more than, say, 50nm thick otherwise the poor mechanical properties of PEI start to dominate the adhesion. At 50nm, and with a relatively low level of chemical bonds, PEI provides a lot of dissipation that soaks up the crack energy. The problem with chemical entanglement is that we often try too hard. We crank up the crosslink density on the grounds that "more is better". This works up to a point, then we start to have catastrophic failure. When the network is too entangled we have the equivalent of a bunch of rigid chemical bonds across an interface which, as we know, gives at most 1N/m. So entanglement is really a way of obtaining strength through Dissipation. Without dissipation, entanglement is merely chemical bonds across an interface.